Gardening For Health was created by Maureen Flett, Clinical Director of The Sports and Performing Arts Injury Clinic. Maureen trained as a sports therapist, specialising in human biomechanics and spinal injuries. She continues to operate a highly successful clinic in North Cumbria. Her treatment and occupational health career spans over ten years, working with some of the world’s premier sports people and local industry, as well as being an author and lecturer. 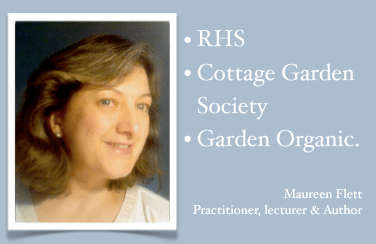 As a keen plantswoman and avid gardener, she is passionate about the many health benefits of gardening but also appreciates how miserable life can be if this is curtailed by injury or illness. With this in mind “Gardening for Health” and “Physio to Grow” evolved to bring help and advice to the green fingered. Our aim is to promote the physical, mental and social benefit of gardening to a wide range of abilities with an emphasis on organic principles. In some other countries such as the US, using gardening as a means of therapy has been well documented for many years and is referred to as Horticultural Therapy.